CycleGreece was created for cyclists who want nature, islands, mountains, antiquities, history, Mediterranean cuisine, an ideal temperate climate and hospitality in one package. Our blog conveys our passion for cycling on Europe’s most southern soil. We vow to turn our guests into bona fide Grecophiles! Today, January 6, 2016, was Blessing of the Waters in Greece. It is also known as Epiphany and in Greek, Theofania. In Greece the custom is for the priests (pappas) to throw a cross into the water and swimmers jump in to the sea to retrieve it. The waters are then blessed by the priests. There was a big crowd today in Paleo Faliro — south of central Athens — to watch the event. The weather was balmy, the waters warm. A number of women were sunbathing in bikinis. Watch the 2:44 minute video of the Theofania. On a recent sunny Sunday in December, my partner and I went cycling in the Marathon region northeast of Athens. The beauty of the ride is that it combines amazing history with a bike route capable for any reasonably fit rider. We parked the car at the conveniently located Schinias Rowing Center which is open from dawn to dusk and equipped with washroom facilities. The place was lively with kayakers plying the lake waters and runners racing to the finish line of a competition in progress. Our biking itinerary made a giant loop totaling 30 kilometers. The excursion took two hours of actual cycling but lasted four to five hours because we were compelled to stop and explore the marvelous points of interest, as well as, eat lunch at a seaside fish taverna. 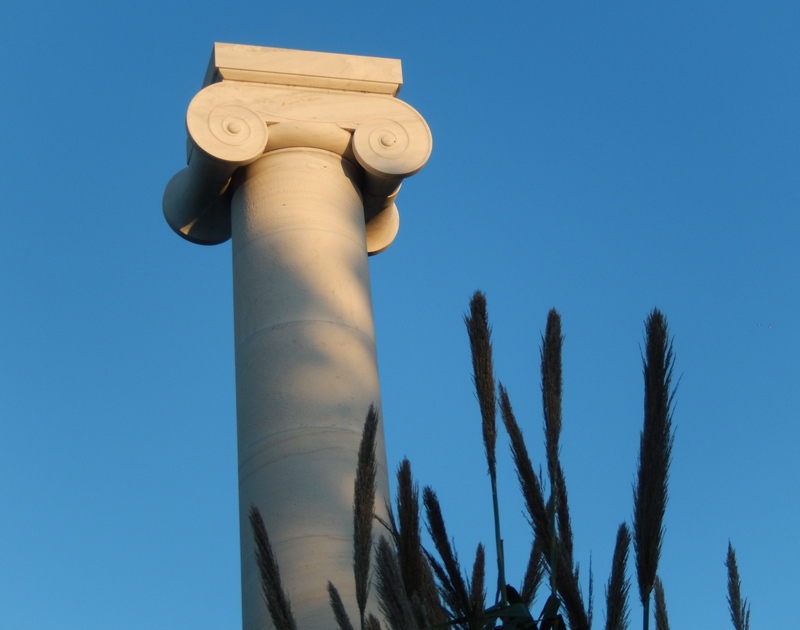 The first antiquity we came upon was the Nike Trophy, a reconstructed marble obelisk located near the spot where in 490 B.C. the Athenians amazingly defeated the Persians even though outnumbered three to one. 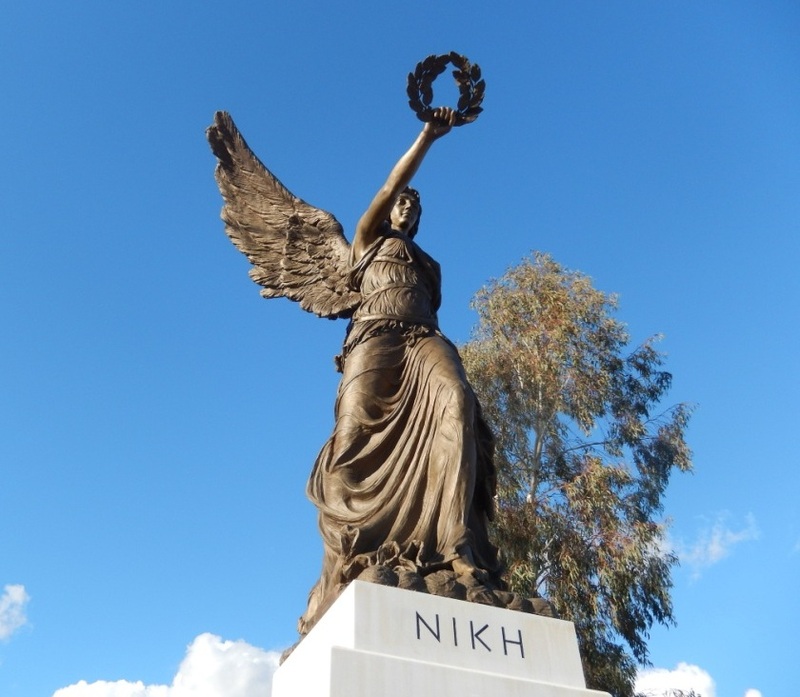 (Nike means “victory” in Greek). In contrast to trophies in battles between the Greek city-states in which the armor of the defeated was hung on a tree trunk, the trophies of the Persian Wars were grandiose monuments. The bike route runs through an agricultural area entirely flat and minimally trafficked. We pedaled past fields of cabbage big as basketballs and broccoli with sprawling leaves fit for a rain forest. 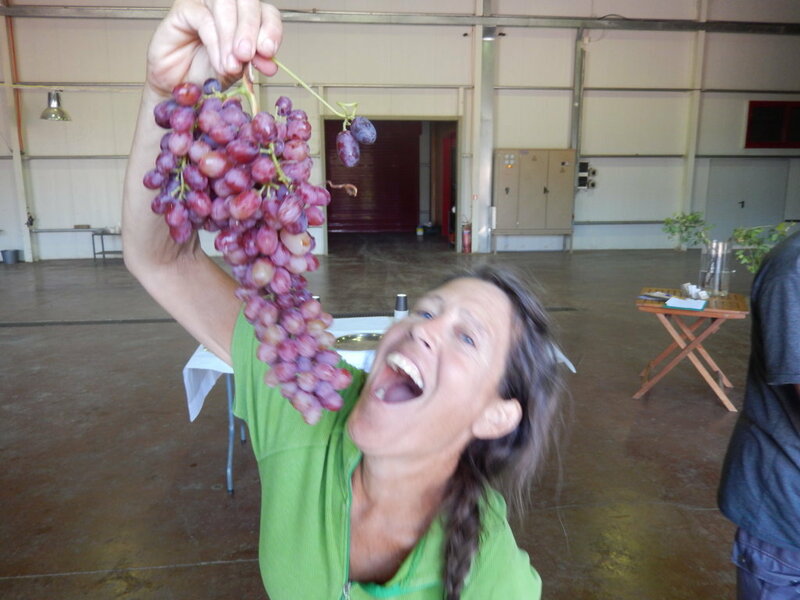 We saw fire engine red tomatoes, orange orchards and vineyards looking forlorn with grapes no longer adorning their vines. Farmers sold fresh produce at colorful roadside vegetable stands. Eventually we arrived at the grassy enclosure of the Marathon Tomb (entry fee three euros). 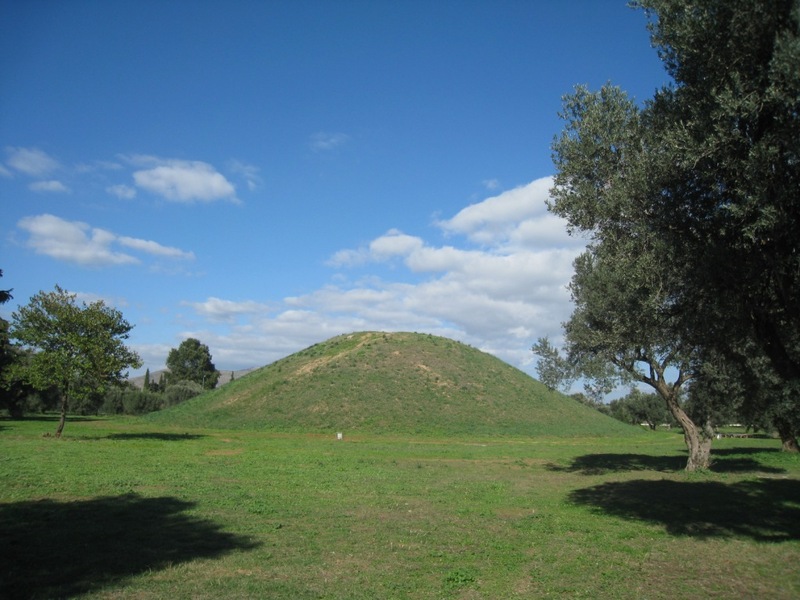 The Greek soldiers’ burial had been lost to history until 1890 when it was rediscovered, excavated and now rises as a swollen green mound (“soros”). This is the precise spot where 10,000 Athenians and 1000 allies from Plateia in central Greece defeated the mightiest super power of the day, the 30,000 “immortals” of the Persian army who prior thereto had only once before been vanquished in war. The battle lasted an hour and resulted in the deaths of 6400 Persians and only 192 Greeks. The enormous confidence enveloping the Athenians by their colossal victory gave them the greatness necessary to create all the extraordinary elements by which they gave birth to Western Civilization. From the Tomb it is a quick fifteen minute ride further inland to the Archaeology Museum of Marathon. One usually thinks of museums in an urban setting but this one is located in an isolated rural environment where tranquility reigns. The prize of the museum is the original Ionic capital of the Nike Trophy. 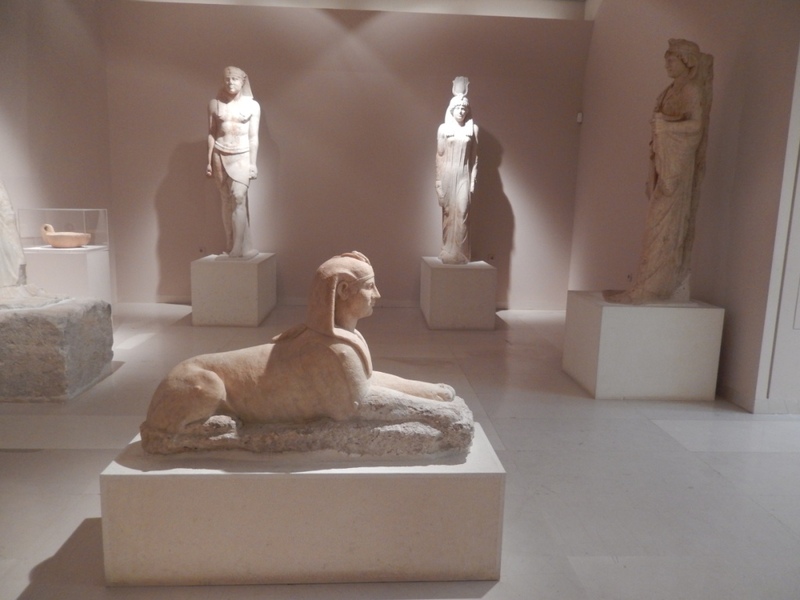 Also exhibited in the small building are pottery from the Cave of Pan and impressive four meter high “kouros” statues from a nearby Egyptian sanctuary. The remnants of that ancient sanctuary lie along the coast in Nea Makri and that is the next destination we biked to upon leaving the museum. It was glorious to reach the Aegean Sea and bike along the wide coastal walkway that stretched from Nea Makri to Marathon’s sea front about eight kilometers away. En route you could glimpse the Egyptian sanctuary through a locked gate but there were only archaic foundations, no marble statuary. Next to it lie the ruins of a 3rd century AD villa built for the Roman Herodus Atticus, but also inaccessibly gated. Families and couples were strolling along the sidewalk, some jogging, a few brave souls swimming and many feasting at the outdoor tavernas with front row seats to the sea. We finally made it back to the Schinias Rowing Center but there was still light in the day and we had not exhausted ourselves. So we continued eastward to the Schinias National Park, a rare aquatic ecosystem in Attika consisting of thirteen square kilometers of springs, swamps, streams, a lake and pine forested beach front. 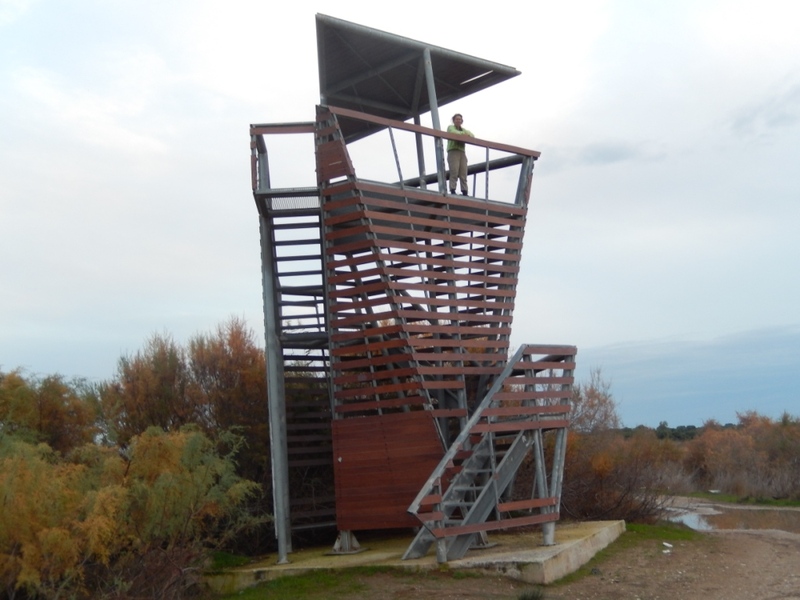 We climbed the tall ranger tower to admire the magnificent view of the sea and mountains in the distance; here birdwatchers seek a glimpse of over one hundred species inhabiting the park, along with foxes, badgers, hedgehogs, rabbits, reptiles, turtles and frogs. Biking on dirt paths in the wetlands, not a soul in sight, at times it honestly felt like we were hundreds of miles from civilization, be it modern or ancient.